While fairy tales have evolved over centuries into the family friendly Disney/Dreamworks films our nieces are all so fond of, they originally began life as terrifying stories of murder and misfortune designed to keep children in line, lest they find themselves in the oven of an evil witch. In that sense, Grasshopper Manufacture's Black Knight Sword takes an old school approach to the world of storybook fantasy, leaving warm fuzzies in a locked box beneath the stairs. Its dark tales of captured princesses, feuding sisters and the eternally damned are permeated by a sense of macabre wonderment that would make Guillermo del Toro proud. Unfortunately, the game is also analogous to fables of olde in a different, more tragic sense: It serves as a perfect cautionary tale for other developers, lest their own games buckle under the weight of their own sense of style. Black Knight Sword casts the player as a suicide victim who is resurrected as the eponymous Black Knight, by a "sword spirit" named Black Hellebore. Imbued with Black Hellebore's powers, Black Knight sets off on a quest to rid the world of the apparently evil White Princess, and her armies of disturbing, awful monsters. It's all very storybook, and like most fairy tales the game's plot is simplified and ambiguous throughout. Vignettes thrown in at the beginning of each level – storyboard-esque tales of woe and misfortune – serve as history for that level's boss. How each boss' story relates to the White Princess or belongs to the overall narrative is never apparent, but the bizarre plot is not without its charm, thanks mostly to a playful narrator and the inventive spookiness of each boss's story. 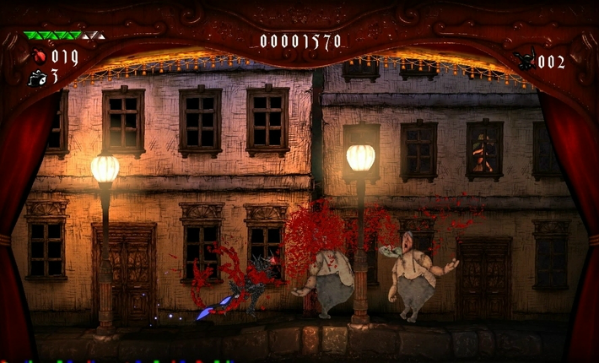 The game's visual aesthetic is as responsible for its "Brothers Grimm" atmosphere as the storytelling itself, communicating on a visual level somewhere between a live theater performance and a pop-up book. 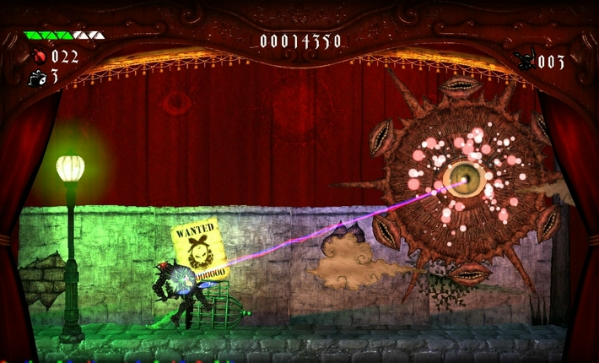 Set pieces are obviously and intentionally two dimensional, and "background" creatures are often represented by cardboard cutouts on sticks, rather than actual sprites or models. Beyond the Black Knight's relatively straightforward appearance, every other living thing in the game is a surreal, grotesque abomination; obese walking heads that spew copious blood, or bizarre spring-mounted pantomime horses that neigh in a terrible fashion. Every creature makes a sound that shouldn't exist and is unnerving to hear, thanks to Akira Yamaoka's unearthly talent for creating the unnatural. Which isn't to say that Black Knight Sword is 100 percent grim-dark, of course. Item boxes are microwave ovens for absolutely no reason, and the player can find hidden "Cat Head Grass" collectibles tucked away in each stage, which are potted plants with adorable cat heads growing out of them. It's all very surreal, and very Suda 51. Black Knight survives this crazy mixed up world by stabbing things with his sword as though it were a lance, rather than swinging it in a sword-like fashion, as one might expect. These rapid pokes can be aimed in any direction, but BK is incapable of moving and attacking at the same time. It's awkward, to say the least, and feels clumsy and inadequate for the task at hand on every difficulty level that isn't "Easy." Black Knight does learn a more traditional sword swipe ability later on, as new moves are added to his repertoire after each boss fight, but the charge-up nature of the attack makes it impractical for constant use. You're going to poke most things to death, and it's going to be weird and frustrating. After said things have been death-poked, they'll usually drop hearts that are collected and used as currency at shops run by a flying eyeball/mouth creature reminiscent of Proginoskes from A Wind In The Door. The silly-voiced monster sells health refills and various temporary and permanent modifications, such as limited-durability armor or an increase in the sword's attack power. 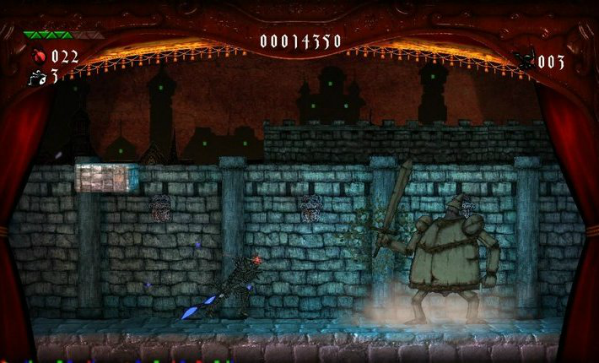 Managing hearts and spending them on the right buffs is integral in successfully surviving Black Knight Sword's monstrously tough "Normal" difficulty level. Yes, Normal mode itself is tremendously hard, but not in such a way as to make the struggle seem worth it, or even remotely do-able. The key to an enjoyable-yet-wildly-challenging experience is accountability; specifically, whether the fault of any given failure is rightly placed on the player, or on the game. If things are done properly, death is the fault of the player: They made a mistake, weren't paying enough attention, failed to properly memorize part of the level, etc. In Black Knight Sword, very few enemy behaviors are predictable enough to work into any sort of definable system, and therefore consistently avoiding death is an impossibility. Being "good" at the game isn't a factor here, and retrying the same level over and over again made me feel like I was toiling away in obscurity, rather than learning or becoming more capable at killing monsters. Being killed by terrible eldritch monstrosities is always preferable to being murdered by programming errors, however, which also happened more times than is remotely reasonable. There's a fairly consistent bug during the second level, in which pausing to save the game causes all walls and floors to be removed, along with their associated collision detection. This will very seldom result in Black Knight falling through part of the level and skipping ahead, more commonly ending with BK plummeting to a horrible, costly death. 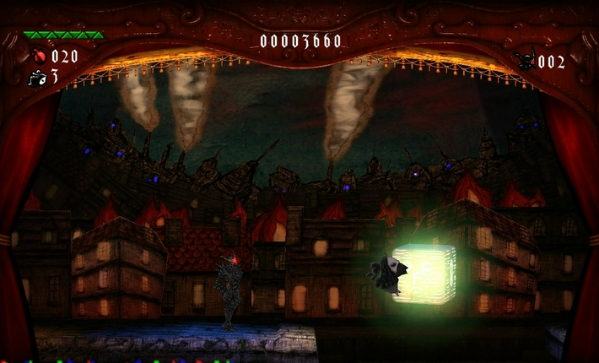 Once Black Knight's limited lives have been used up, which happens rather quickly, the player is presented with two options: Restart, or quit to the main menu. Restarting places the player back at the very beginning of the level and removes any accumulated hearts, magic attacks and/or power-ups they may have managed to acquire before they died. Alternatively, the player can quit to the main menu, reload their most recent save and start back at the nearest checkpoint with everything they'd worked so hard to achieve still intact. This method is so clearly superior that no sane person would ever choose to restart the level entirely, making the whole system an inconvenient waste of time. Black Knight Sword's lack of an autosave function requires that the player save manually and save often – couple that with the bug mentioned above and the overall difficulty curve, and you've got the makings of a grueling progression through Normal. Easy mode, on the other hand, is a walk in the weird, gross park by comparison. The disparity between Easy and Normal is so vast that fights which took a solid hour of continuously reloading save files on Normal were breezed through in three or four minutes on Easy. In fact, I only experienced one Game Over during my Easy playthrough, as compared with the dozens and dozens I had accumulated on Normal. That one ultimate death was experienced during Easy mode's final boss fight, which is about as hard as Normal mode's second boss. The differences aren't just limited to the boss encounters, though. Abilities possessed by regular enemies are scaled way back, and the types of enemies present in each level, along with where they are placed, is radically altered. Additionally, more microwaves populate the world, and the bounty they contain is more likely to be health or an extra life. The thing is, once I was no longer under the oppressive thumb of the infuriating game design, I did find a few things to enjoy. Black Knight Sword's fables and events are more inventive than they seem at first blush and are at times even hilarious, such as the delightfully absurd shmup segment wherein Black Knight rides atop an enormous dead chicken. Sword poking is even less annoying, since any given monster requires fewer pokes before it explodes in a shower of gore. Heart management doesn't play nearly as big of a role either, and overall Black Knight rarely wanted for health, extra lives or available magic power throughout Easy mode. The experience was effortless, but that's not exactly a good thing. Compared with Normal mode yes, Easy is an improvement, but it's gone too far in the other direction. Now there's no challenge at all. Where is Goldilocks' perfect bed? Lo and behold, defeating Easy mode unlocks Easy Mode +, which is the precise middle ground between Easy and Normal. This explains the cavernous difficulty gap between the two modes, but does not justify it. Black Knight Sword's ideas are interesting enough to waltz through Easy mode, but requiring a second playthrough to experience the game as it should have originally been is a presumptive overestimation of how charming the macabre aesthetic actually is. Had the actual gameplay been less clunky, more well balanced, more challenging and less aggressively abusive, Black Knight Sword's sense of style and unique presentation would have been healthy bonuses on top of an already stable foundation. As is stands though, the game's artistic atmosphere and sense of self are all it has going for it, and sadly that's not quite enough. This review is based on a PSN download of Black Knight Sword, provided by Digital Reality.